Mi Electric’s strategic advantage is the know-how to deliver innovative electrical solutions to save our clients time and money. We use cloud-based applications for quality assurance and contract administration, giving our clients around-the-clock access to the latest project information. 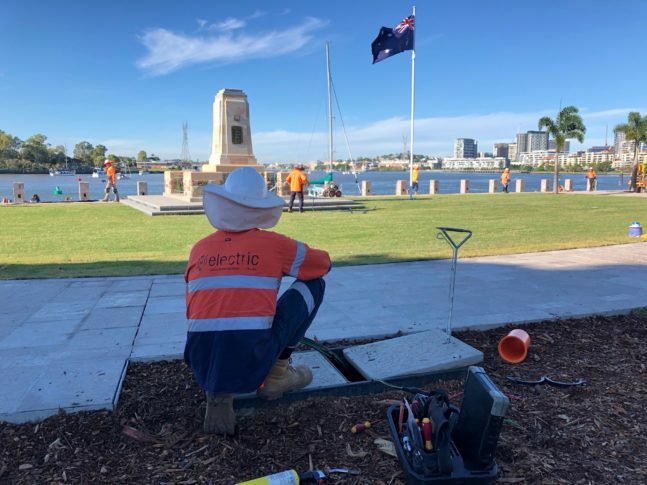 Following on from our successful completion of the Burnett Heads Streetscape Project, Mi Electric was selected to undertake electrical and communication works on Stage One of the Elliott Heads Foreshore project. 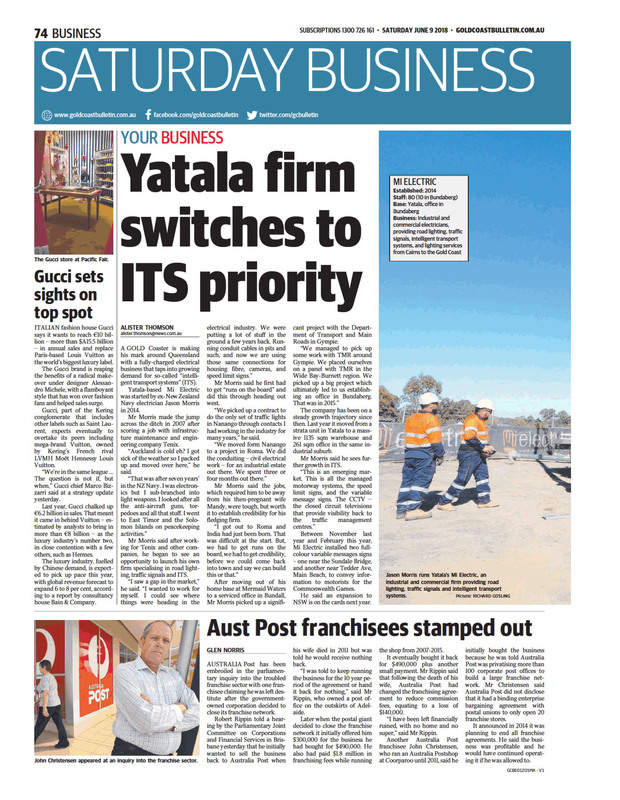 These works include service relocations, new switchboards and a new turtle-friendly lighting solution. 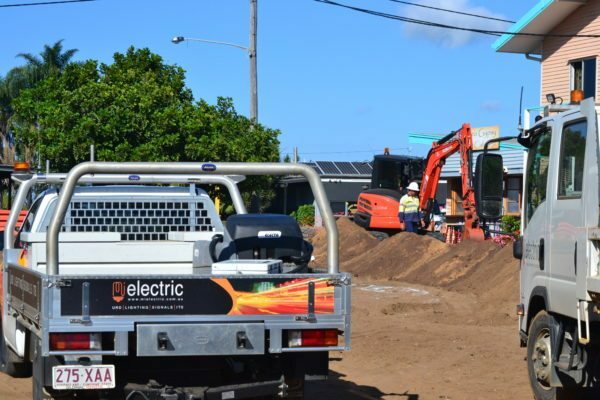 Mi Electric is currently upgrading pedestrian facilities at the corner of Walker and Barolin Streets in Bundaberg. Works at this busy intersection include new footpaths, pram ramps and bike lanes, with this Department of Main Roads and Transport project due to finish mid-April. At the end of 2018, Mi Electric finalised electrical installation works for one of its largest projects to date, the Gateway Upgrade North. Over the past 20 months our team completed the mammoth task of installing 622 road lighting poles, 210 kilometres of cabling and eight sets of traffic signals on the job – equating to approximately 65,000 man hours. It’s that time of year again, folks! Our office will close at 4:00pm on Thursday, December 20th and re-open on Monday, January 7th. We wish all our valued clients a safe and happy holiday season. 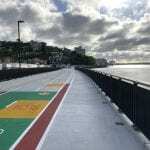 Mi Electric has installed 30 lights along the newly-opened Kingsford Smith Drive Riverwalk, including both street lighting and pedestrian lighting. 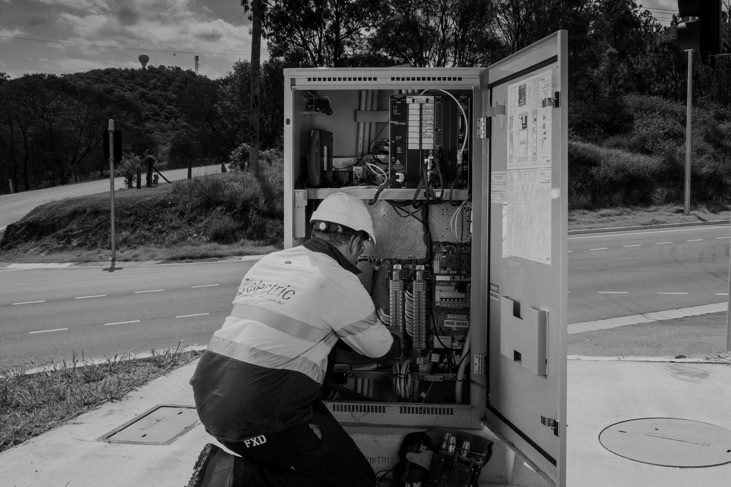 Our scope of works also included completing the ITS infrastructure, where fibre cables were installed to carry Brisbane City Council services such as traffic signals and a public safety system. 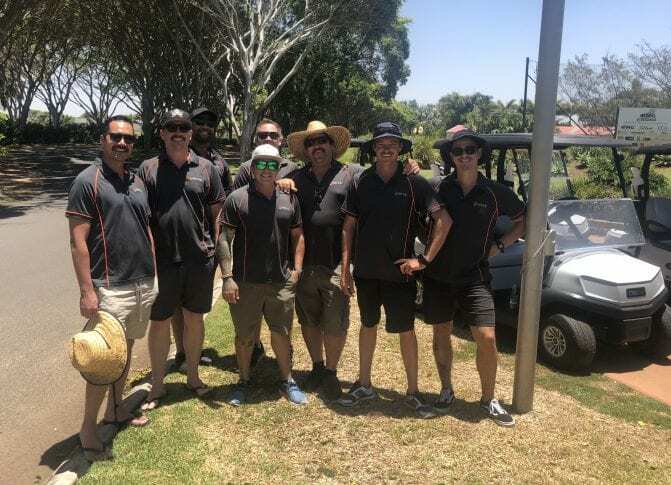 Some of Mi Electric’s biggest hitters were out in force this month to support the Bundaberg Department of Main Roads and Transport Golf Day. The annual day, hosted by the DTMR Social Club, aims to bring local businesses together in a relaxed environment and build rapport. Mi Electric is now on site at the Logan Enhancement Project (LEP), with works to provide lighting to Bridge 19 currently underway. 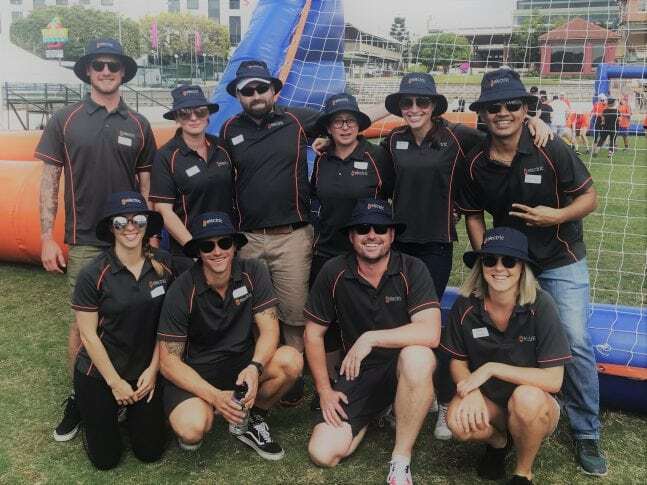 Mi Electric was proud to take part in this year’s Transurban Charity Challenge, an annual event which raises much-needed funds for Ronald McDonald House. Thanks to Transurban for hosting and well done to all teams involved, who together raised $240,000. 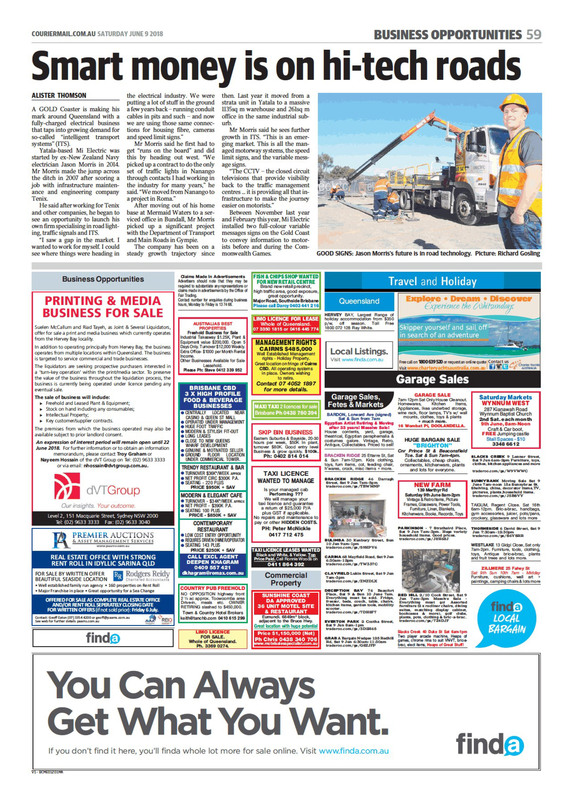 Mi Electric has been awarded the interim lighting and traffic signal package on Stage 1 of the Mackay Ring Road. 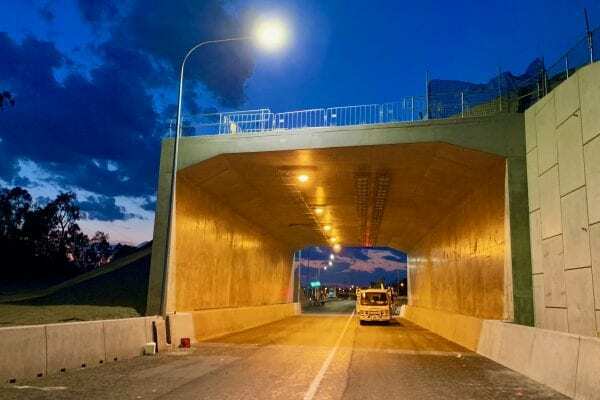 The project is an 11.3 km route which will connect the Bruce Highway at the Stockroute Road roundabout in the south, through to Bald Hill Road in the north. 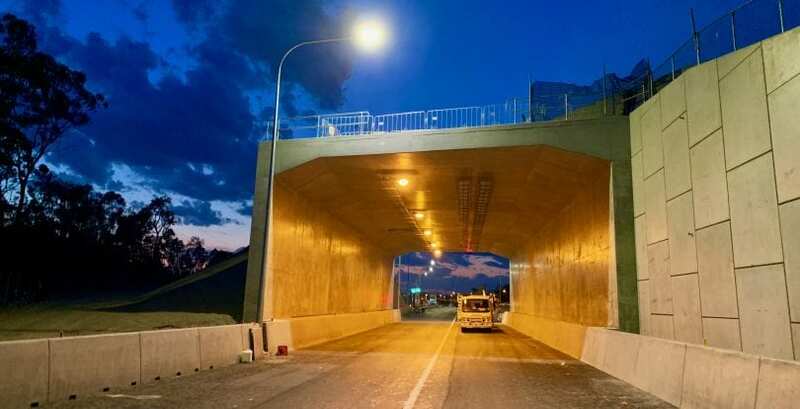 The $512 million dollar Logan Enhancement Project has reached a new milestone, with Mi Electric recently being awarded both the ITS and Lighting Fitout/Cabling and Underbridge Lighting components of the project. MiE’s scope includes installing backbone cabling, distribution boards, field cabinets, CCTV and vehicle detection. The project is in full swing with commissioning and handover set for June 2019. This project is being undertaken by CPB Contractors on behalf of Transurban. Mi Electric commissioned the Dohles Rocks Road intersection today, which allows both Moreton Bay City Council and Transport and Main Roads to view the roads within their own internal monitoring systems. 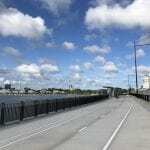 The project included installing new traffic signals, which co-ordinate with the Bruce Highway on-ramp signal control system, plus a new footpath and footpath lighting. 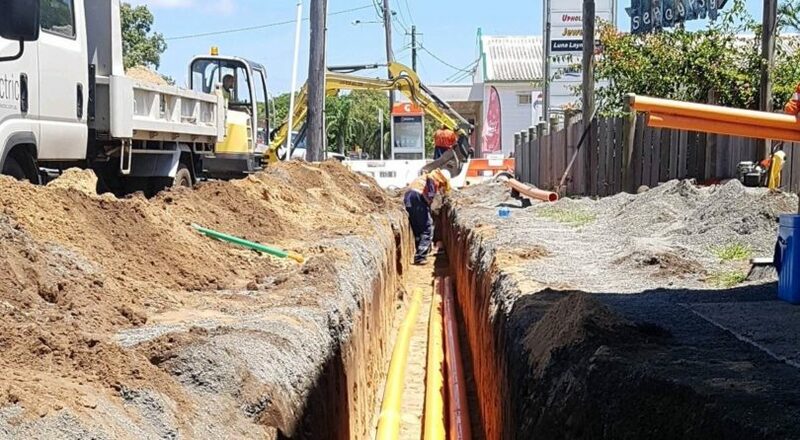 Mi Electric has commenced construction on three overhead fibre installations for Nexium Telecommunications (part of the Energy Queensland Group). Two of these installations are in Chinchilla and one is in Moranbah. 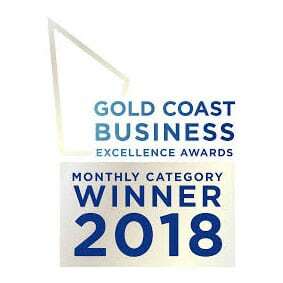 Mi Electric was the proud recipient of the Mayor’s Innovation award at this month’s Gold Coast Business Excellence Awards. This prestigious award is given to a company that demonstrates ‘innovation through new knowledge, technologies, methodologies or processes to improve the effectiveness of quality of outcomes for their clients, community and/or the public sector”. MiE Director Jason Morris accepted the award from Acting Gold Coast Mayor Donna Gates. 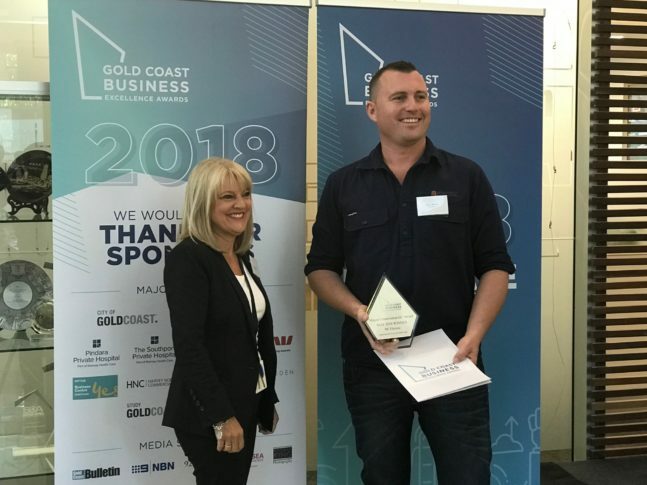 Mi Electric is now in the running for Gold Coast Business of the Year at the Gala Award Ceremony in November. Well done, team! MiE has a new baby! 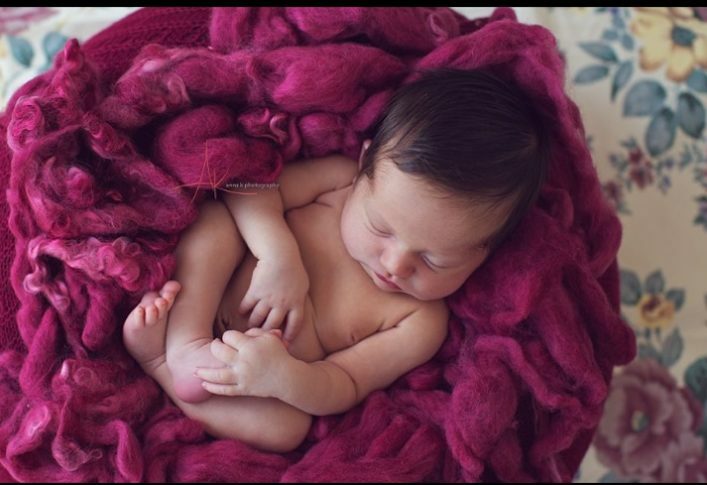 Congratulations to Shane from our Wide Bay Depot, and his partner Molly, on the birth of the beautiful Mia Irene Edelmann – or MiE. Coming in at 8 pounds and 2 oz, she is sure to melt the hearts of the Mi Electric – or MiE – family. During tomorrow’s ANZAC Day ceremonies, Australia and New Zealand will pay tribute to their soldiers who served in war, conflict and peacekeeping. 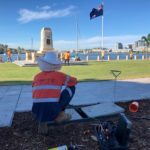 As part of Brisbane City Council’s Kingsford-Smith Drive upgrade, Mi Electric has spent the last few weeks installing new architectural lighting adjacent to the Cameron Rocks Reserve War Memorial. Lest we forget. 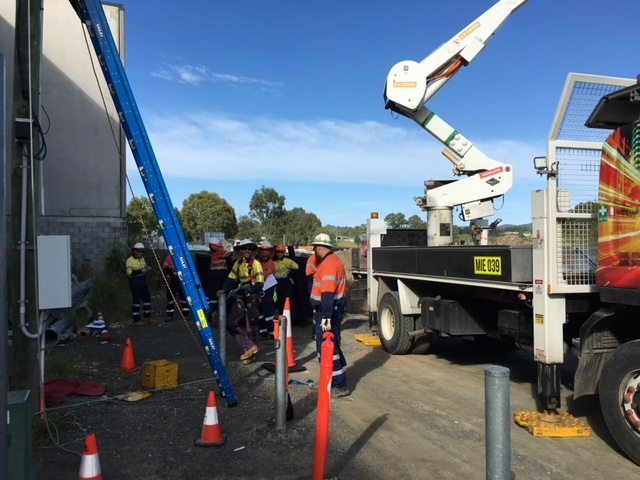 Today Mi Electric staff took part in one of the compulsory bi-annual training days at the Queensland Headquarters in Yatala. Polarity refresher training, Pole Top Rescue, Elevated Work Platform Rescue and CPR were some of the topics covered. 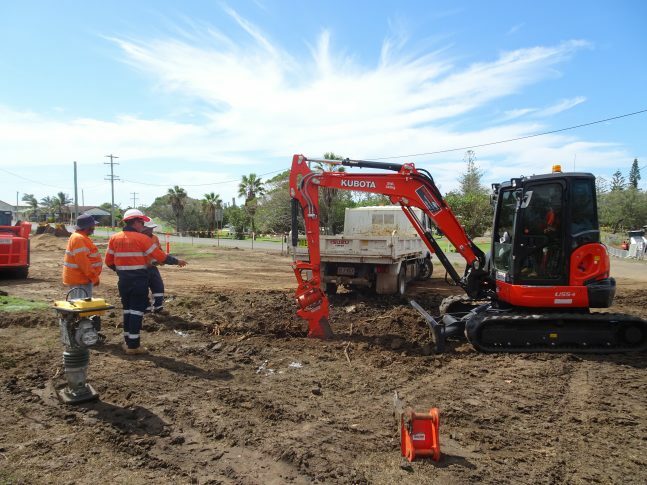 Mi Electric started work on the utilities trenches at Brisbane’s new Parallel Runway Project this month. 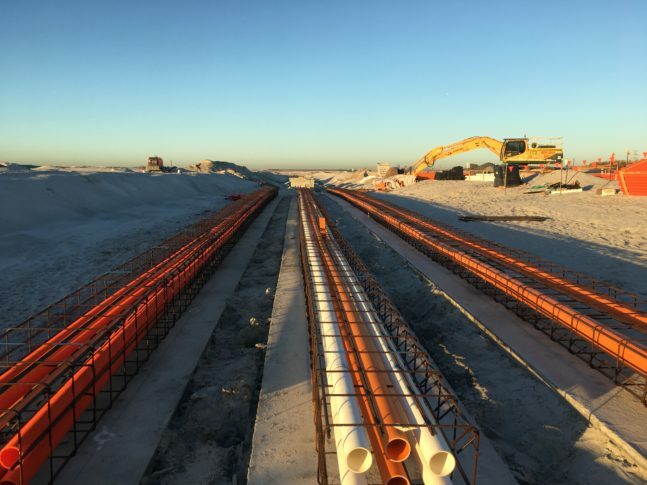 The runway is being constructed by Skyway Joint Venture and is expected to commence operating in 2020. 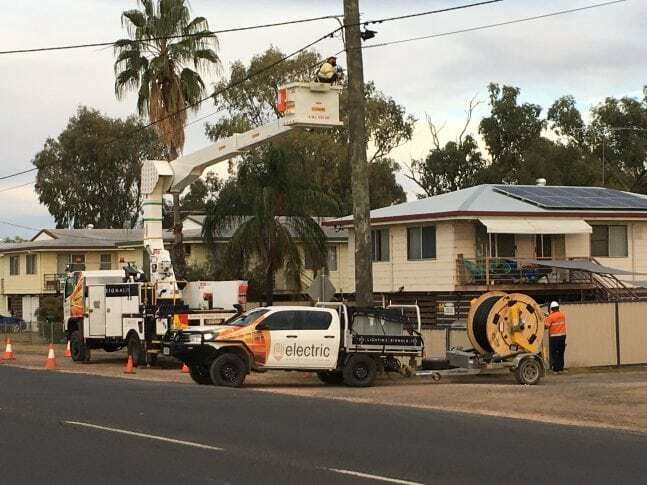 Mi Electric installed 144c core fibre on the Telegraph Road Corridor Upgrade (Stage 2) this week, meaning new CCTV cameras and Variable Message signs can soon be erected. 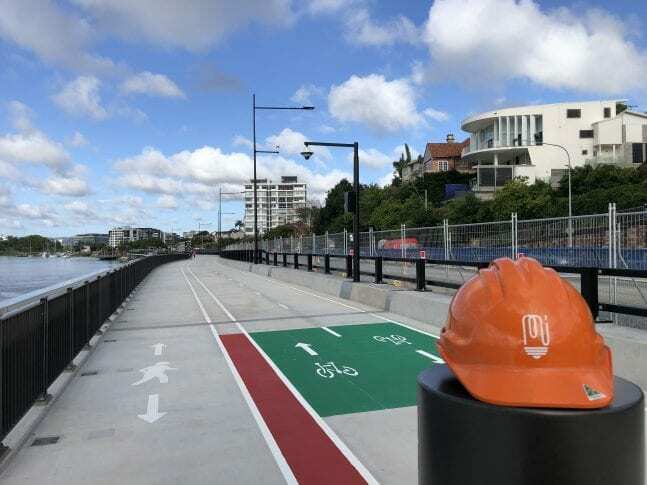 Mi Electric is working with Georgiou Group on this Brisbane City Council project, which is due for completion by the end of the year, weather permitting. 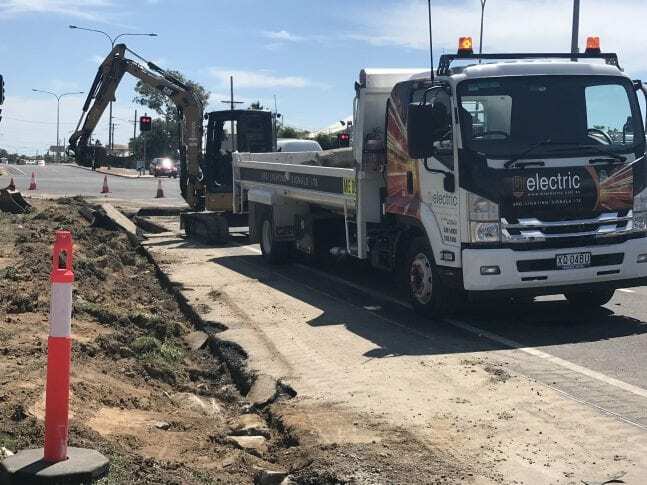 Mi Electric recently began laying conduit for the Burnett Heads Streetscape Project, which when completed will replace the existing Ergon overhead network and power the new street lighting and CCTV network. 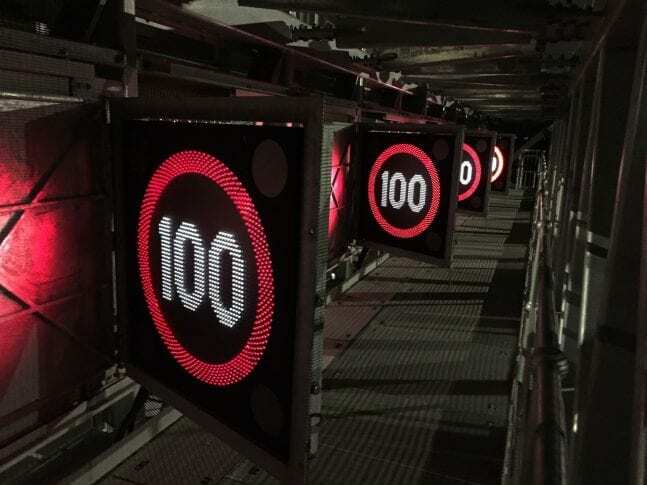 As part of Transurban’s T2K Project, Mi Electric removed and re-installed Variable Speed Limit Signs above the Gateway Bridge northbound lanes. 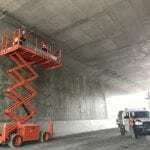 These works utilized our crane truck and both our 14-metre insulated elevated work platforms (EWPs). 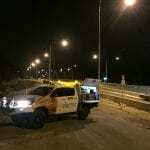 Works were done at night to minimize traffic disruptions. Mi Electric is looking forward to working with a new client in 2018, recently securing the electrical components of two Hazell Brothers projects. The Pialba-Burrum Heads Road project (Hervey Bay) will be primarily facilitated by our Wide Bay depot, and Dohles Rocks Road (Griffin) will be serviced out of our Queensland HQ in Yatala. Mi Electric has completed installation of two Variable Message Signs on behalf of Gold Coast City Council; one in Southport and one in Main Beach. These signs will convey important information during the largest sporting event to be staged in Australia this decade, the 2018 Commonwealth Games. 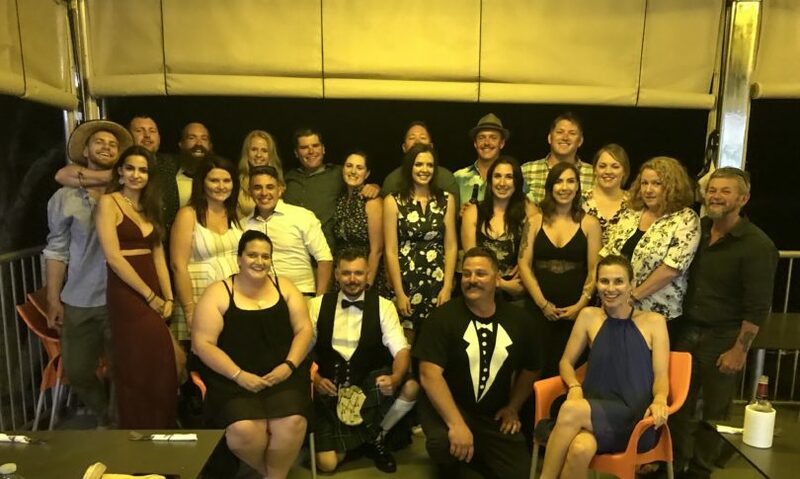 More than 40 staff members plus their partners celebrated the end of the working year with dinner and drinks at Brisbane’s Stamford Plaza. The gentlemen scrubbed up rather well and all of the ladies looked stunning – it certainly made a nice change from hi-vis! We wish all of our valued clients a safe and happy holiday season. With the Wide Bay Mi Electric team based in Bundaberg, this year we thought we’d take a cruise down the Burnett River with some live music to kick off our Christmas Party. A terrific evening was had by all staff and partners, with a special shout-out to Jonny who arrived sans underwear in his Scottish kilt. Thanks to Grunske’s for the delicious food after the boat! Our office will be closed over the Christmas Break, but the on-call mobile will be in operation for emergencies (ph: 0429139654). Merry Christmas everyone! MiE Managers visited Roads and Maritime Services (RMS) in Sydney this week, to witness Factory Acceptance Testing on two full colour Variable Message Signs being built for the 2018 Commonwealth Games. Mi Electric has been appointed by Gold Coast City Council to install these signs. Development Constructions Pty Ltd have awarded the electrical works for the Burnett Heads Streetscape project, near Bundaberg, to Mi Electric. This exciting scope of works includes the integration of smart technology, such as CCTV, Wi-Fi and an electric car charging station. Our Wide Bay Depot has moved! Our Wide Bay depot has moved, giving the team a whopping three times the amount of floor space! Our new address is Shed 7, 138 Enterprise Street, Bundaberg. This office serves as our base as we service road lighting and traffic signals throughout the Wide Bay area. Mi Electric have been engaged to install and commission Variable Message Signs at both Ada Bell Way and Tedder Avenue, where these streets intersect with the Gold Coast Highway. 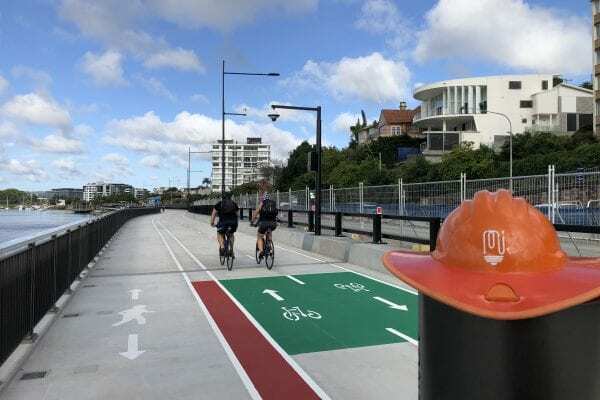 This contract was awarded as part of Mi Electric’s place on the Gold Coast City Council’s pre-qualified panel for Intelligent Transport System infrastructure. 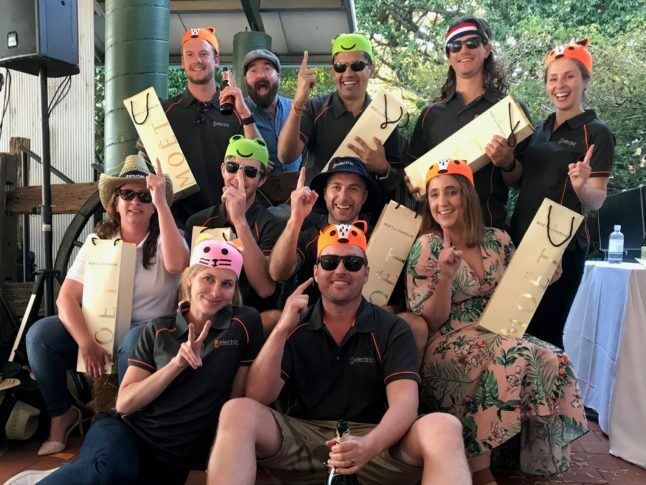 Mi Electric was the proud winner of last week’s Transurban Charity Challenge, an annual event raising money for Ronald McDonald House. The team won in double-whammy style, both in overall points and the Team Spirit Award. Well done team and thank you for your efforts in making the day a success! Many thanks also goes to Transurban who put on a fantastic event year after year, for a very worthy cause. 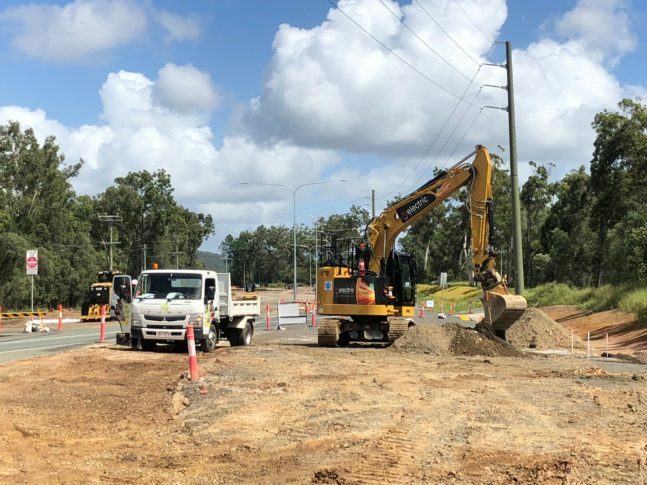 Mi Electric has been selected by Doval Constructions to undertake the electrical component of the Waterford-Tamborine Road intersection upgrade. 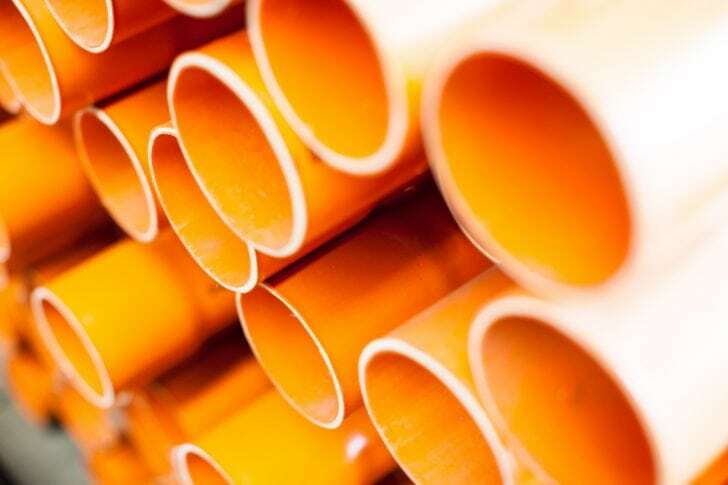 These works include installing five new sets of traffic signals, 85 road lights and three kilometres of fibre optic cable with related ITS devices. 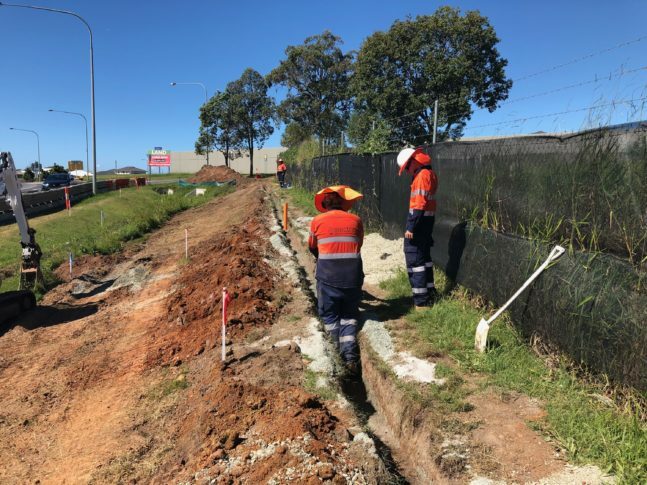 As part of the Telegraph Road and Lemke Road corridor upgrade project, Georgiou Group has selected Mi Electric to install more than 100 street lights, three sets of traffic signals and upgrade the Brisbane City Council fibre network with CCTV cameras and Variable Message Signs. These works will also include upgrading the Energex reticulation network. RoadTek has enlisted Mi Electric to install a new set of traffic lights and LED street lighting at the intersection of Maryborough-Hervey Rd and Urraween Rd, which aims to improve safety for local motorists and pedestrians. Works have already started and are expected to be complete by mid-September. Mi Electric’s Queensland HQ recently moved to much larger premises just down the road from our previous address – you will now find us at 39 Commerce Circuit, Yatala. Works have started on the Gateway Upgrade North project, with Mi Electric selected by Lend Lease Services to fulfill the substantial electrical package. 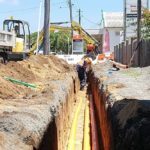 This multi-million dollar project further cements Mi Electric’s position in the South East Queensland electrical market, with works including 600 road lights and more than 50 kilometres of fibre optic cable. 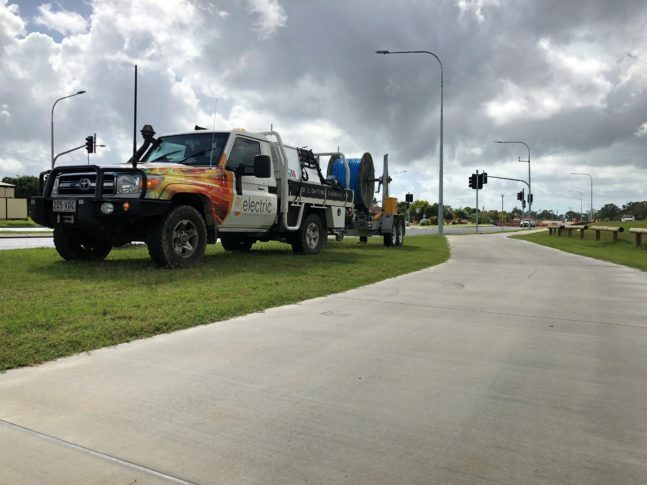 With Kay McDuff Drive being extended to the Bundaberg Ring Road, Mi Electric has been selected by Berajondo Earthmoving and Haulage to supply and install both DTMR and Ergon public lighting. Mi Electric is installing new traffic signals and street lighting at the intersection of Lipscombe and Deception Bay Roads in Deception Bay. These works will improve safety for local motorists and pedestrians. 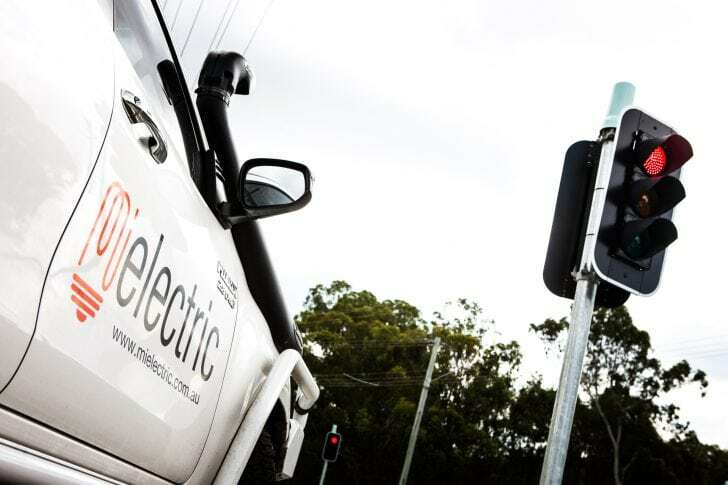 Mi Electric has been engaged to replace the vehicle detector loops between Gympie and Nanango. 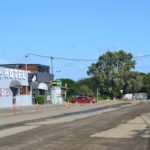 This will include places such as Pig Creek and Apple Tree Creek in the Bundaberg Region. We are as happy as a pig in mud! 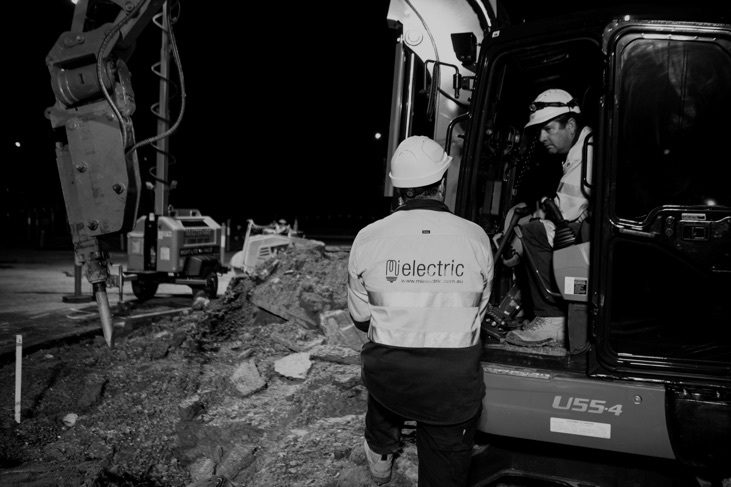 Mi Electric has been successful in our bid to provide the Electrical & ITS works for the Telegraph Road Upgrade Project. Works are expected to be completed by June 2017. 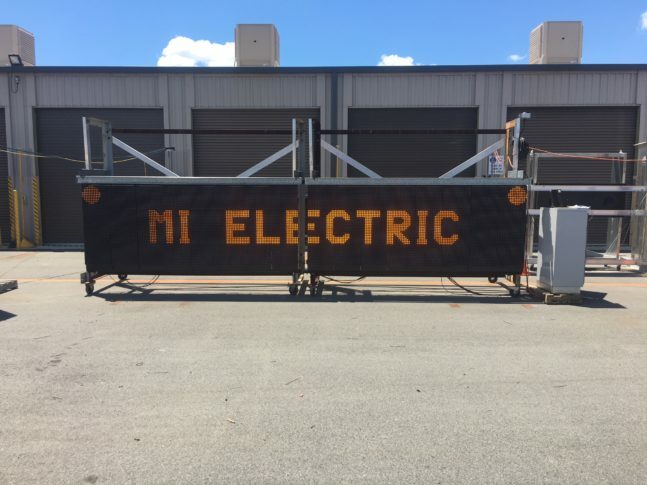 Merry Christmas to our employees – Mi Electric has a new fleet! Mi Electric has expanded our fleet, with five new Toyota Hilux Workmates wrapped in our new branding. Looking schmick, boys! 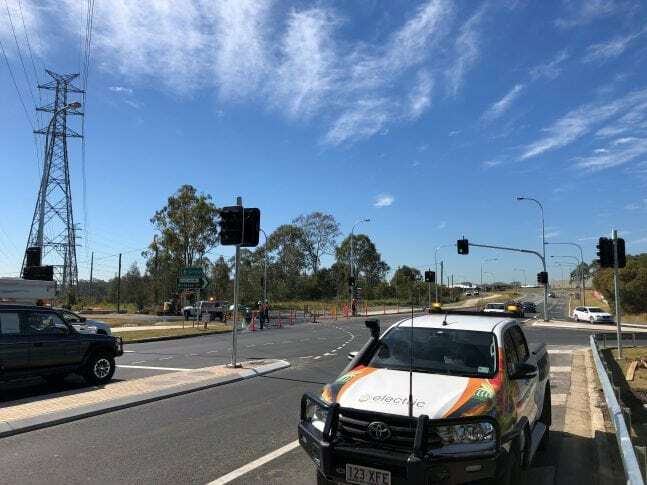 With Jupiters Casino undergoing a revamp, Mi Electric has been contracted to install traffic signals on a new intersection being created on the Gold Coast Highway opposite Elizabeth Avenue. Works are set to begin in the coming weeks. 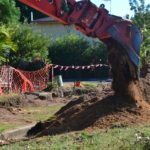 Mi Electric has begun works on a new four-way signalised intersection at the corner of Alice and Richmond Streets in Maryborough, to improve access to the local shopping centre. Lighting and signal upgrade works have begun at North Street, the through-road for traffic wanting to travel on the M1 northbound from Nerang. Mi Electric has finished installing 19 new LED pathway and wall lights along Ivory Lane in Brisbane’s CBD for Brisbane City Council. With the pathway lights positioned on a cliff face, these works were considered high risk, so specialist rope technicians were enlisted to ensure the crew’s safety. 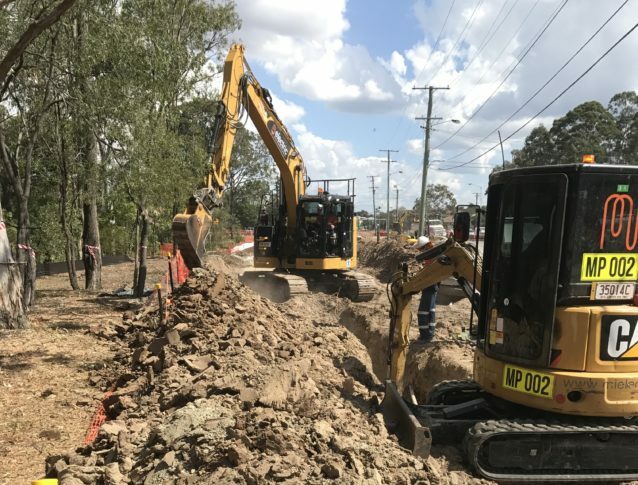 Moggill Constructions has engaged Mi Electric to carry out traffic signal augmentation at Victoria Avenue and King Street, Woody Point, in preparation for an upcoming stormwater drainage upgrade. Mi Electric will commence work on the Isis Highway this month, installing vehicle detector loops between Bundaberg and Childers. These works also include the reinstatement of pavement. Georgiou Group Pty Ltd has appointed Mi Electric to supply and install 80 road lighting poles at the Tinana interchange, with works set to begin this month. 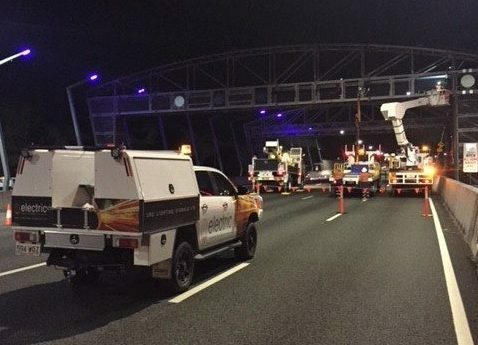 Mi Electric has begun the Go Between Bridge ITS Improvement Project, which will provide incident detection, roadside asset visibility and vehicle count information through to Transurban Queensland’s Traffic Management Centre. Mi Electric has implemented a Quality Management System which meets the requirements of ISO 9001:2015. This System ensures the company has best-practice procedures in place to achieve sustainable growth, conformance to customers and excellent overall performance. 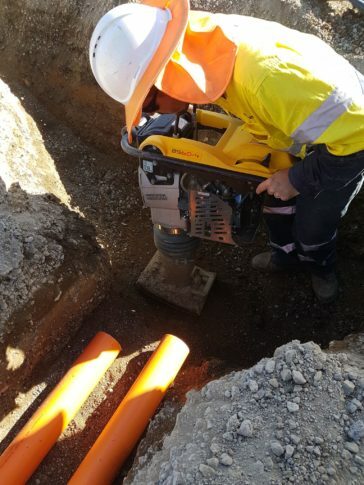 Mi Electric has started the underground reticulation works at stages 7, 9 and 11 of The Peninsula development, Springfield Lakes. 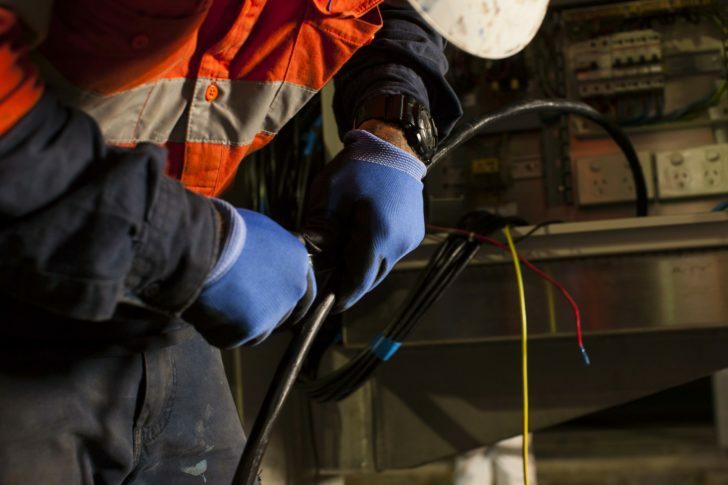 Bellwether Contractors recently appointed Mi Electric as the electrical contractors for the Low and High Voltage reticulation, set to commence this month. 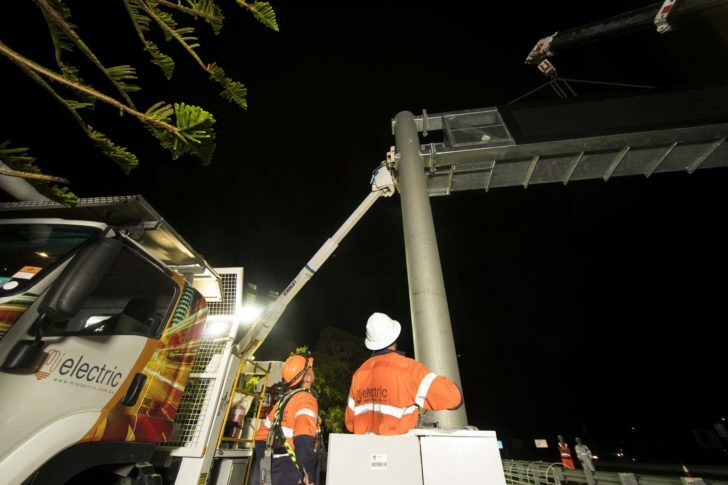 Mi Electric has been awarded the Cairns-Bruce Highway controller upgrade project. This includes the upgrade and augmentation of five sets of traffic signals from Tully to Cairns and is due to commence in June 2016. 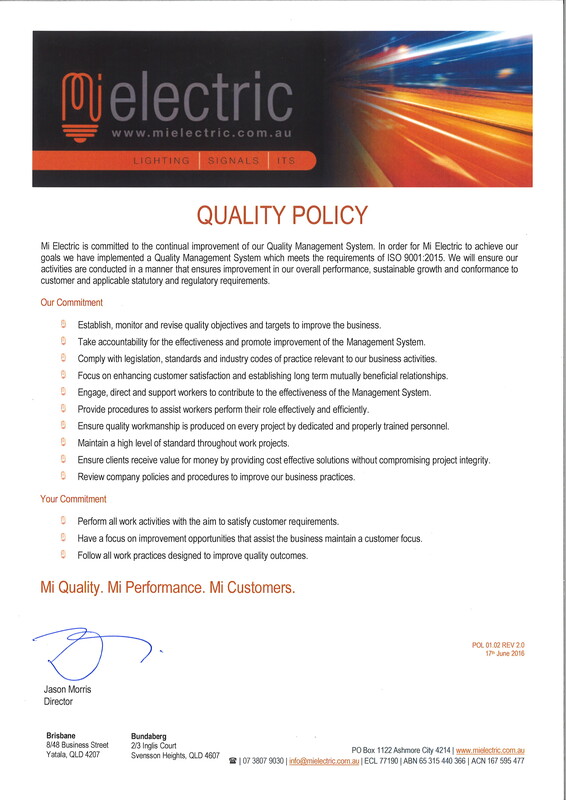 Mi Electric was established in early 2014 with a focus on delivering traffic infrastructure and electrical reticulation projects throughout Queensland. Via our Queensland HQ (Yatala) and our Wide Bay depot (Bundaberg), we service both metropolitan and regional areas. We focus on developing strong leaders in the electrical industry. Our team is a dedicated group of experienced tradesman who strive to be the front runners in efficiency, high standards and innovation. We pride ourselves on our response time and are committed to ensuring our clients have competent and professional contractors on hand. Mi Electric staff are dedicated to the effective management of Occupational Health, Safety and Welfare. In fulfilling this responsibility, we have a duty of care to provide and maintain a working environment that is safe and without health risks. We take these obligations seriously and empower all team members to adopt a lead-from-the-front approach. 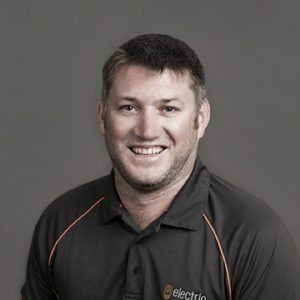 Jason is an innovative and results-driven electrician who has built a first-class team in traffic infrastructure and underground reticulation and distribution. His lead-from-the-front approach focuses on attention-to-detail and solid client relations. With nearly two decades’ experience in the industry, Jason has a proven ability to meet tight deadlines with technically sound and cost-effective solutions. Some of his major accomplishments include the Logan Motorway Free to Flow to Tolling (Logan), Enoggera Army Barracks Enhanced Land Force Stage 2b and the Airport Link, Airport Roundabout Upgrade Project. Aaron is a technically-savvy individual who brings more than a decade of skill to his projects. He has a cooperative attitude and prioritizes his tasks effectively, delivering exceptional results. 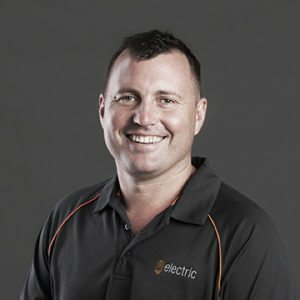 Aaron has driven the electrical components of notable jobs including the Douglas Arterial Duplication/Port Access Road (Townsville), the Logan Motorway Condition Assesment (Logan) and the unique ‘turtle-friendly’ road lighting at Rifle Range Road (Bundaberg). 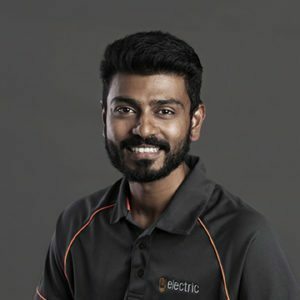 NJ draws on a wide range of engineering and construction experience in the electrical and Intelligent Transport Systems (ITS) fields, bringing innovative solutions to each project he manages. His in-depth ITS experience gives him an edge in the ever-evolving ITS industry, with ITS being vital to the future of Australia’s road infrastructure. 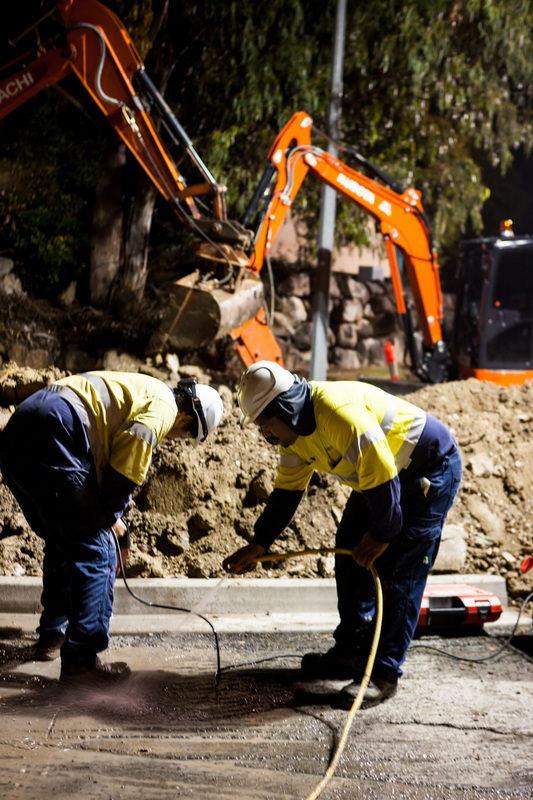 NJ is currently overseeing many of the major electrical components of the Kingsford Smith Drive upgrade in Brisbane. Safety and efficiency are prioritized in every aspect of his work. Our dedicated Intelligent Transport Systems Manager Chris understands the future of road infrastructure. With the ability to design fibre systems, knowledge of Visio, AutoCAD, SCATS and Streams to name a few, he knows ITS backwards and can explain it in simple terms to our stakeholders. Chris is committed to complying with Australian Standards and takes great pride in the quality of his work. His portfolio includes Brisbane City Council’s Inner City Bypass Tunnel fibre upgrade, the Energex Substation fibre rollout at Brisbane Airport and the ITS component of the Kingsford Smith Drive upgrade. Cathal is at the helm of our Wide Bay operations, based at our Wide Bay Depot in Bundaberg. 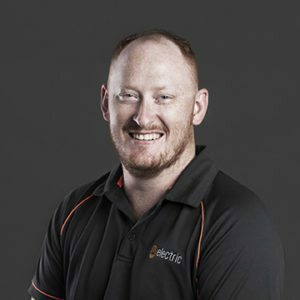 With a history of high-quality electrical installations in both Australia and Ireland, Cathal leads his team with an emphasis on safety and attention-to-detail. His problems-solving skills and personable attitude are instrumental in delivering his projects on-time and on-budget. In this role, he is also responsible for both the Bundaberg and Kingaroy Department of Transport and Main Roads maintenance contracts (RMPC), providing 24-hour on-call assistance in the event of an incident or accident causing damage to the electrical networks. Before joining the Mi Electric team Cathal lead the electrical installation of several high-profile commercial projects in Ireland, was an inspector on the Curtis Island Plant Project and carried out electrical works throughout the Wide Bay, including assisting in the 2011 and 2013 flood repairs. Our employees are essential to driving our success, so we’re always happy to hear from talented people interested in joining the business. If you’re team-oriented, motivated and looking for a career where you’re challenged and rewarded, Mi Electric could be the right place for you. We focus on developing strong leaders in the electrical industry. Our team is a dedicated group of experienced tradesmen who strive to be the front runners in efficiency, high standards and innovation. © 2019 Mi Electric. All rights reserved. Designed and Developed by TROPiXEL.